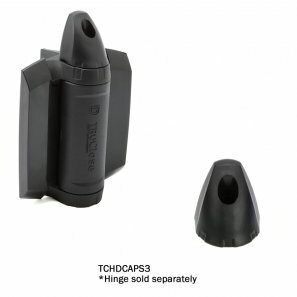 Safety cap for heavy duty hinges. TruClose Heavy-Duty Standard hinges deliver dependable TruClose reliability for pool safety and general-purpose gates around homes and yards, as well as high-traffic gates. These hinges are ideal for retrofitting existing gates as they will fit to gates gate gaps ranging from 1/4"- 1" (6mm-25mm). For heavy duty range square frame gates weighing up to 154 lbs/70 kg. Works best with ornamental aluminum or steel gate and fence materials in high use areas.